Audiences are in for a treat this summer as the Center for Puppetry Arts reprises their original production of Rumpelstiltskin! Featuring fun music and all the antics of the infamous imp himself, this classic Brothers Grimm fairy tale is sure to spin grins onto the faces of kids and adults alike! “My daughter can spin straw into gold!” brags Kate’s father. Now, held captive by the greedy queen, Kate must find a way to make good on her father’s boast or remain imprisoned! A mysterious little man appears and offers his magical assistance…but at what price? 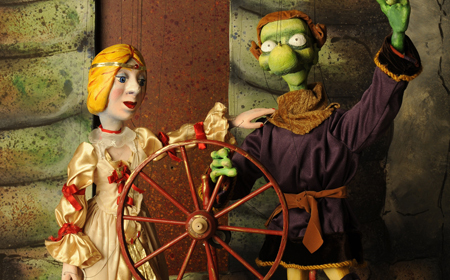 Adapted by Bobby Box and Michael Haverty, Rumpelstiltskin is performed with colorful, hand-crafted marionettes designed and constructed by the Center’s own puppet builders. Amy Sweeney, the Center’s head puppeteer, makes her directorial debut with this lively production that features veteran puppeteers Reay Kaplan and Tim Sweeney. · Thursday-Friday: 10:00 a.m. and 11:30 a.m. Please note this production has no performances on Tuesdays and Wednesdays. However, patrons may enjoy the Center’s Discovery Days programming on Tuesdays in August and September. Tickets include Museum admission as well as the Create-A-Puppet Workshop (or To-Go Kit), where children can make their own Blue Bird rod and string puppet. TICKETS ARE $9.25 (MEMBERS) / $16.50 (NONMEMBERS) AND CAN BE PURCHASED ONLINE AT WWW.PUPPET.ORG OR BY CALLING THE TICKET SALES OFFICE AT 404-873-3391.